This is a story that is best left until you read it for yourself. I choose to review this book during winter because, well, that way you’ll have at least maybe an eighth of feeling of what it was like for Lina. This is a shocking story of the Stalinist repressions of Lithuanians. It’s a story that is written in fiction, but was born from fact and needs to be known. Sepetys language is brilliant and heartbreaking and frighteningly real. You feel the emotions of the characters, you gasp in breathe at the destitution of their situation. You cry when their heart breaks because your heart is breaking too. When I was home in America, I had become close to a Lithuanian family. The shocking reality of what these people attempted to survive is…there are no words for how they lived and were taught to never mention a word. This is history, although it’s written in fiction, it is still history that desperately needs to be known. In a starkly honest view, Sepetys paints how life would have been life for a Lithuanian family that was highly educated with opinions. Their stories need to be heard, and this book is the one that tells it with grace and civility. Sepetys’ words are hollow, but strong and angering all at the same time. Her book is powerful and it needs to be read. 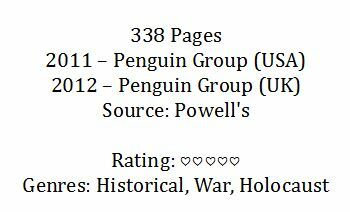 This is a sliver of World War II that grossly goes under the radar. For those that are sensitive, this might not be the best book, but I can’t back down in how I feel that this novel, although it is fiction, is a fantastic and a frightening depiction of what life was like for Lithuanians during WWII. It’s time their voices be heard. It’s time their stories be known. They are still afraid and that is the powerful message at the end of the story that proves true. For American’s, this is history relatively unknown or understood. That needs to change. 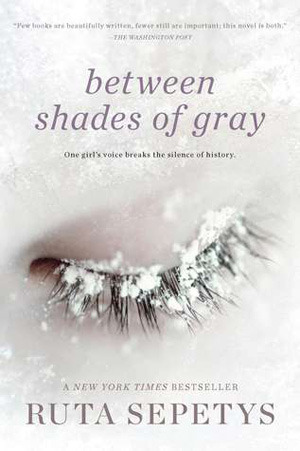 Between Shades of Gray opens up the world during a time when the world was a terrible place. Sepetys does an amazing job making it clear that once the war was over, not everyone won. This book is not just for teens, but adults would do well to understand the difficulties of those not from this land. This is the eye-opener. This story makes you appreciate what you have. Stop ignoring the past. Between Shades of Gray gives evidence to our future. How will we roll the dice? Let’s be accepting of everyone this time.